Everyone knows who they are. They're grunts. They're human shields. They're the guys Joker dresses up so someone looks more ridiculous than him. They're the henchmen. They're punching bags. Adam Beechen strives to give the faceless an identity with Hench, a graphic novel chronicling the henchman career of Mike Fulton. Originally a college linebacker with dreams of making it in the pro's, Fulton's dreams are dashed when he's injured during a game. Without a football scholarship to fund his education, and bills stacking up for his critically ill son, Fulton turns to crime not only to make ends meet, but also to capture the excitement of his earlier days. The tale opens with Fulton holding a gun to the head of a bound and apparently helpless superhero named The Still of The Night. The rest of the story is told in flashback as Fulton reflects upon how he could've mucked up his life enough to end up in a situation where he either has to kill or be killed. Like another recent AiT/PlanetLar release, The Planet of The Capes, superhero norms are turned on their head in a way that isn't really all that new. The heroes aren't so heroic; the bad guys aren't all that bad. And, once again the heroes and villains are designed as homage to existing characters like Superman, Daredevil, The Joker, and so on. But Beechen isn't really trying to say anything new about the concept of superheroes, other than to answer the question of how these kooky supervillains could ever find anyone willing to act as cannon fodder. Beechen convincingly describes why a man would embark on a career he knows full well can only end badly. And while Fulton's life of crime has none of the glamour of the protagonist of Mark Millar's Wanted, like the banal and cowardly life Wesley Gibson leads before becoming a villain in that series, when you look at Fulton's alternative, wiping the butts of costumed felons doesn't seem all that bad. Hench is a story about finding redemption. Mike Fulton could've been a gangster, a gangbanger, a compulsive gambler, or a drug dealer. This is a story we've heard before. 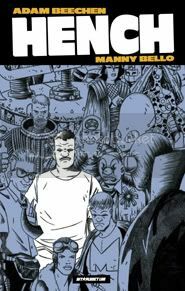 Beechen and Bello give him funny costumes, deposit him into the world of superheroes, and what follows is a funny, sad, and disarmingly believable story about a man looking for salvation.